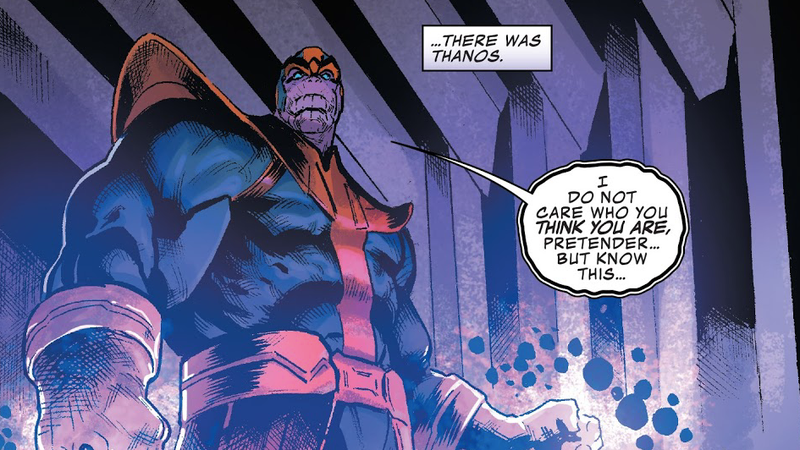 Issue #14 of Thanos opens with its titular character reflecting on his distant past—specifically the day he was born on the Saturn’s moon Titan to a woman named Sui-San. The day was Wednesday and everything about Thanos’ delivery was seemingly normal until Sui-San was able to actually look at her baby. But this issue of Thanos also explains that before actually meeting her son, Sui-San originally intended on giving him another name he hadn’t heard since the day he killed her when he was 12 years old. Thanos jumps forward in time to pick up with the thread the series has been following since a badass Ghost Rider from space (with a shard of the Time Stone) showed up out of nowhere, wrapped Thanos in chains, and took him for a little joyride into the unknown. As it turns out, this particular Ghost Rider works as a sort of herald for Thanos’ future self who is now seeking his younger counterpart’s assistance with a mysterious plan. Upon arriving in the future, Thanos immediately attacks the Ghost Rider and when his older self attempts to explain what’s going on, the two begin brawling—mainly because the younger Thanos refuses to believe what he’s being told. So no, there is no Dione, the Mad Titan. Only Thanos—and not just because that’s his chosen name, it’s quite literally the one his mother decided to give him.